Gautier, Miss. - This used to be the heart of a great American savanna. Now it's about all that's left. We always hear about savannas in Africa, where lions roam the grassy meadows and giraffes nibble at treetops. 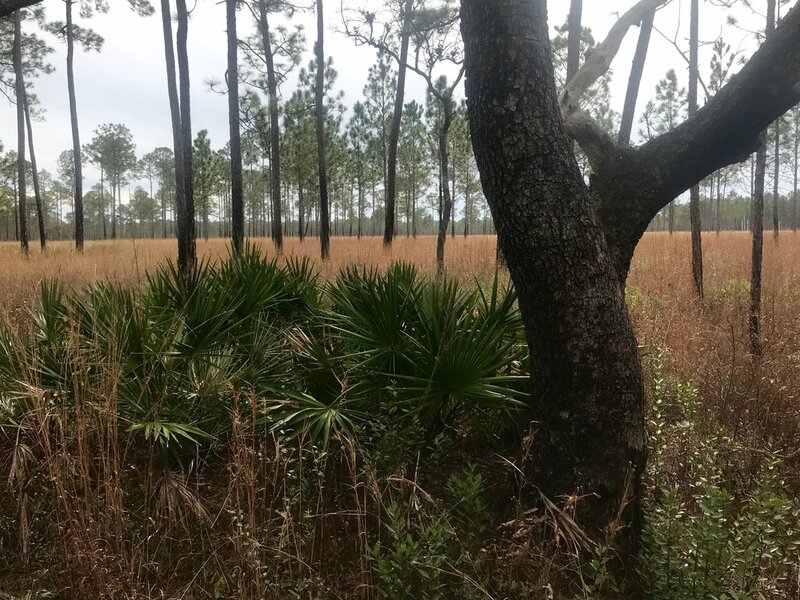 We almost never hear about the American savanna, especially the wet pine savanna, which used to cover millions of low-lying acres along the Gulf Coast from Louisiana to the Florida Panhandle. No lions or giraffes roam the wet pine savanna. In this domain, the sandhill crane is king. Cranes are large – as much as five feet tall, with a six-foot wingspan – and look prehistoric. Indeed, fossil evidence shows the species is at least 10 million years old, making it the oldest bird species still with us. The rarest of these birds is the Mississippi sandhill crane. This is the only place in the world you can find the Mississippi sandhill crane in the wild, and it takes luck to find one at all. They are elusive, we were told, and don’t like being disturbed by people. We went looking anyway. The wet pine savannas that the cranes call home are flat, grassy, with water-logged, acidic soil and widely dispersed trees, mostly long-needled pine. They require periodic wildfires to keep out competing vegetation. For centuries the savannas went largely undisturbed, even after Europeans settled the Gulf Coast, in part because people couldn’t figure out how to squeeze profits out of it. But after World War II, timber companies figured out a way. They bought up the savannas and got government to buy it as state and national forests for their use. They cut ditches to drain the swamps and turned them into pine plantations: acres and acres of scratch pine trees, planted in neat rows. The ones I saw barely grow big enough for a two-by-four before they are harvested and chipped up for composite products. People also started putting out the wildfires that sustain the savanna habitat. And with the advent of air conditioning, the population grew, turning savannas into parking lots and subdivisions in the process. By the mid-1970s, the wet savanna habitat had shrunk to less than 5 percent of its previous size and the Mississippi sandhill crane was on the brink of extinction. Naturalists counted 30 to 35 still in the wild, with just five breeding pairs. The Interstate Highway System threatened to finish the job, with I-10 slated to slice through the middle of what was left of the cranes’ domain. Bird lovers objected, sparking a “cranes and lanes” debate here over economics and conservation. This time, the conservationists had a new weapon. In 1973, Congress passed, and President Richard Nixon signed, the Endangered Species Act, providing legal protection for threatened species. The Mississippi sandhill crane was one of the first species officially classified as endangered and the first to be the subject of a federal court case. That resulted in the creation of the nation’s first wildlife refuge dedicated to preserving a single species: The Mississippi Sandhill Crane National Wildlife Refuge. The refuge preserves and manages nearly 20,000 acres of pine savanna habitat. Invasive plants are removed and controlled burns keep the savannas pure. A captive breeding and release program has helped build up the Mississippi sandhill crane population, which is now about 135. That still makes them one of the rarest birds in North America. But we got lucky. We spotted a not-so-elusive pair walking through front lawns not far from the road. Long legs, long neck, grey body with a punk-like slash of bright red on top of their heads. The Endangered Species Act has been under attack since the day it was signed, mostly by people who think obscure plants and animals shouldn’t get in the way of freeways and profits, and the struggle continues. The Trump administration is removing protections from some species and resisting adding species like the lesser prairie chicken to the endangered list. But this is about more than politics and money. The cranes and the other rare plants and animals found here are part of a much bigger picture. Scientists have identified five “mass extinctions” in the earth’s history, periods when more than 75 percent of the planet’s species went extinct. The most recent was 66 million years ago, when the dinosaurs disappeared. Biologists believe we are in the middle of the sixth mass extinction, and likely to lose half or more of all species by the end of this century. Human-caused climate change and loss of habitat are the main culprits. We may not be able to stop the tide of extinction, but we must not ignore it. The bald eagle came off the endangered species list 10 years ago the good way, as populations continued to grow. Last month, the Eastern cougar came off the bad way: It was declared extinct. But, for now at least, the Mississippi sandhill cranes are holding on.